Our current products build on the foundation of precision punched and formed parts manufactured using up-to-date automatic punching machines, hydraulic presses, eccentric presses and servo press technology. Here, the crucial expertise relates to progressive die punching and drawing tools. Downstream processes such as robot welding, thread cutting and plastic overmoulding complement our individual component production. Everything involved is of course state-of-the-art. KICO develops tools and special-purpose machinery for flawless and efficient production – a significant advantage in global competition. We can guarantee long-term serviceability for our products thanks to high quality materials, tempering processes and surface coatings. 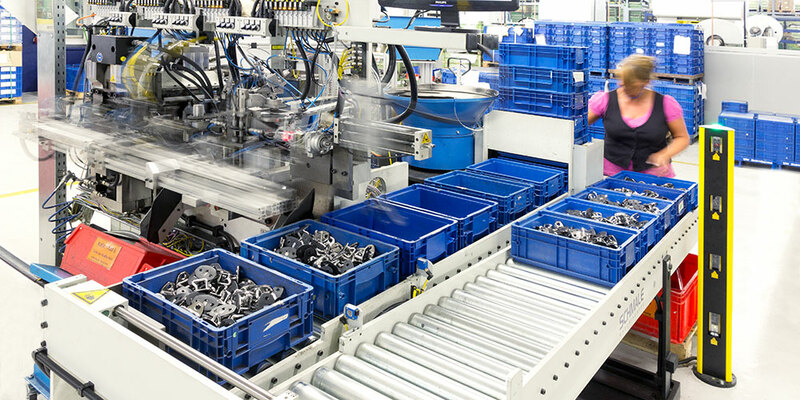 Assembly is carried out on semi-automated assembly lines or automatic machines. The most important operations here are joining, riveting, screwing and checks with the associated end-of-line tester. Experienced specialists using our powerful ERP system provide just-in-time production and distribution according to customer requirements.